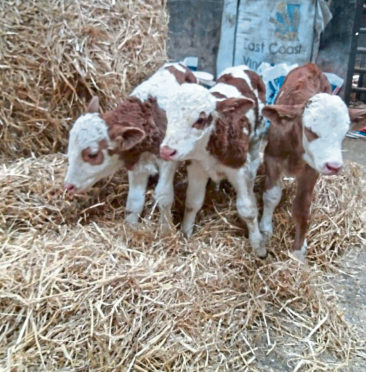 The triplet bull calves were born at Carsgoe Farm, near Halkirk, run by James Gunn and his son Graeme. They are by the farm’s Simmental stock bull Team Glencoe and out of a home-bred Simmental cow by a Corskie sire. Local cattle breeding inseminator Willie Mackay described the event as a “statistical miracle”. Mr Mackay, who is a Highland councillor, said: “I remember the first set of triplets that were got by artificial insemination (AI) in Caithness way back in the summer of 1973 and over the years there have been a few sets of triplets in the county after farm stock bulls.